I had planned to talk about the weather, start there this post with. But this morning when I was looking in my bloglovin, I saw a post of Nia, and she wrote the sweetest thing about me.. I really have to thank her so much for her awesome writing piece. Sweetie, you will be the best mom too!! For those who wanne read it, look here. And yesterday when I woke-up from my night shift I got the greatest picture send by whatsapp. A picture of the bride with my wedding garter on her leg. Then lets show some crafts..
We start with Jingles, as it´s the last day of the months, so Jingles Time!!! It was a bigger piece, but with such lovely colors again. We are almost half-way there!! Then I have finsihed the bunny's. I like Satin, it's beautifull thread, it's stitch really easy.. In my last somebunny, needed to stitch with a awfull thread, but Satin I like!! My Horse on a stock, is progressing awesomely fast!! I finished all the part. Tomorrow going to the IKEA and buy a bedding, that I can use for stuffing, so it's not to heavy for Kira to play with. Above is the body with head, then on the left the two ears, and right the nose. I really can't wait to see it finsihed..
My last craft for this post is a order from my BIL. A friend of him is expecting a baby this summer, and asked me if I could make a baby minion hat!! My cute neighbor boy (5 months old) was my testing person, as I don't have baby's to try it one.. and he looks so cute with it! Noah asked me if I would help him make a bookmark. 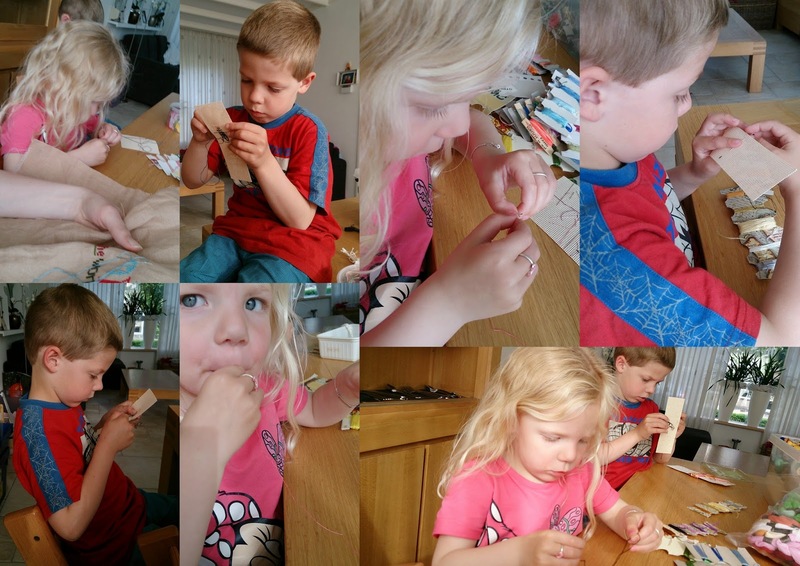 I went to my attic, found some supplies, and we have been stitching with the three of us, even Kira wanted to do it too again!! Look at that cute concentrated faces.. see Noah his face!! It was very very very quiet at the table. Can you see what Noah's making??? A Jedi, all by himself.. How great is that!! Kira is making a present..
halfway it was totally full, but as you can see on the above pic's she does it all on her own. She makes the thread wet, put's it in the needle, stitch it, and then cut it all again.. They didn't want to go to bed, but tomorow we will do some more stitching!! So off to bed now!! have a great Sunday all!! Weer mooie updates. Vooral de konijnen in potten borduurwerk is erg leuk. Wow, you have all been so busy! You have made some really cute stuff, the bunny's are lovely, you just want to cuddle them! Lovely work as usual. The bunnies turned out so cute. I read Nia's blog post and I understood how she feels about you. You are such a great Mom. And how good it much have felt to have the garter so appreciated! And now you've got a whole studio of assistants! So many beautiful things to see around here that I have to write in parts..eheheheh. The idea of making their own bookmark was incredible! your son has an awesome notion of proportions...the drawing is so cool! The bunnies are just darling!! I love it! The cross stitching projc is cute as well,I already tolda ya in another post :D I'll have to have the courage to finish. The minion hat is so cute! Congrats! Those bunnies are just too cute....love them!! 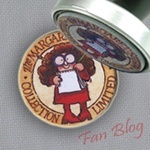 Wonderful post Annette!! I read Nia's comment and it's true of both of you!! HEART! Jingle is so festive for June!! The bunnies are adorable! I want to be your kid! lol!! I spied the horse you made for Kira..so cool! The hat is amazing! You'll have to send me the link for the pattern!! Love the concentrated faces hard at work creating. Adorable!! HUGS!! Well done on the Jingles and those little flower pots are adorable! The photos of the kids crafting are so cute--tell Noah his Jedi looks wonderful and Kira's pink creation is so pretty, too. Her hair is so long now--just beautiful!! You are such sweet personality Annette- we all can feel it even we have not met in the real life. 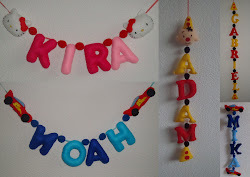 Noah and Kira stitching together are the best ever.. I am sure they have both inherited your creativity. 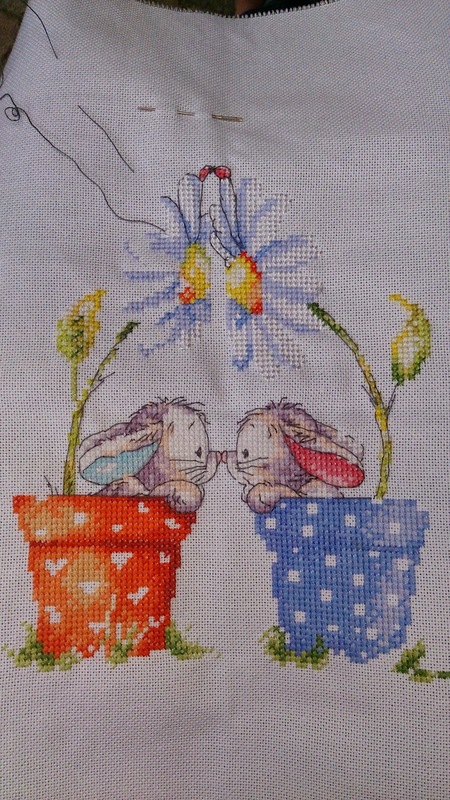 I really love,love Some Bunny t Love stitchings and your is very pretty!